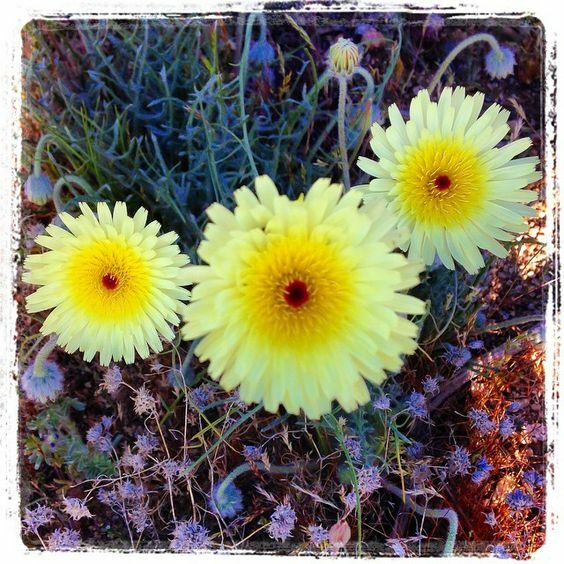 Recent winter rains to hit California has a produced a plethora of spring wildflowers across the state. From Redding all the way to San Diego, flower seeds are germinating and roots are spreading. In just a few short days, the California’s deserts and inland valleys will explode into a rainbow of colors producing red, pink, yellow, purple, blue and white bi-colors. So, here’s a list of the best places to see wildflowers in the Inland Empire, including Riverside and San Bernardino Counties. Grab a pair of binoculars and have fun exploring the wildflowers! The paved Alpine Pedal Path has three main access points including Juniper Point, Stanfield Cutoff, the Discovery Center and Serrano Campground. The best wildflower viewing occurs during the months of May through July however, there are a variety of shrubs and perennial herbs that continuously bloom along the trail year-round. Plant species vary across a rainfall gradient that extends from the east end of the Pedal Path to the west end. A beautiful montane meadow is located near the Juniper Point entrance where tall Juniperus occidentalis (western juniper) trees can be observed just to the west. The east end consists of drier plant communities dominated by Artemisia tridentata (big sagebrush) and Ericameria nauseosa (rabbitbrush) while the west end towards the Solar Observatory consists of plant communities that require more moisture including Salix lasiolepis Shrubland Alliance. Some showy annual herbs include Abronia nana ssp. covillei (desert sand verbena) Sisyrinchium idahoense (blue-eyed grass), Penstemon labrosus (San Gabriel beard tongue), and Lupinus excubitus (grape soda lupine). Big Bear Discovery Center is a prototype for urban forest Visitor Centers around the country. Paved sidewalks around the Center allow visitors to view native plants growing in their natural environment. Signs identify over 20 plant species and a small native cactus garden has been recently created. Some of the identified plants include rubber rabbitbrush, yellow rabbitbrush, big sagebrush, California buckwheat, firecracker penstemon, bumblebee penstemon, Bridge’s penstemon, red mountain bugler, curl-leaf mountain-mahogany, sulfur flower, Wright’s buckwheat, flannelbush, singleleaf pinyon pine, rose sage, interior rose, Utah service berry and Rydberg’s horkelia. At the Center, there are two popular adjoining trails where visitors can create their own journey. The Alpine Pedal Path is a 3.5-mile long asphalt path that wanders along the north shore of Big Bear Lake. It is an easy path accessible for hikers, skaters, joggers, strollers, and wheelchairs. A list of plants observed along the Alpine Pedal Path is available at the Center. The Cougar Crest Trail is a 4 to 5.5 mile long natural path that leads through a variety of habitats. It is moderate to difficult; the first mile is a gentle uphill climb, but gains altitude thereafter. The Cougar Crest Trail ends at the juncture of the world famous 2,650-mile Pacific Crest Trail. The Mountaintop Ranger District encompasses an incredibly diverse section of the San Bernardino Mountains. The Champion Lodgepole Pine Trail is an easy one-mile round trip hike located on the south side of Big Bear Lake. The trail features a wet meadow and mature conifers including the largest recorded lodgepole pine (Pinus contorta) in California! The self-guided trail has 14 numbered posts that correspond to an interpretive guide which is available at the trailhead. The hike begins by crossing over a small wooden footbridge where a year-round stream parallels the trail. Spring wildflowers include kelloggia (Kelloggia galioides), columbine (Aquilegia formosa),andAmerican speedwell (Veronica americana). Large boulders, old growth white fir and Jeffery pine punctuate the views along the trail and provide ideal habitat for San Bernardino beardtongue (Penstemon caesius), great red paintbrush (Castilleja miniata ssp. miniata), white catchfly (Silene verecunda),and woolly sunflower (Eriophyllum lanatum var. obovatum). The surrounding meadow is especially beautiful in the spring and presents a diverse assortment of native flora throughout the growing season including western mountain aster (Symphyotrichum spathulatum var. spathulatum), corn lilies (Veratrum californicum), Parish’s yampah (Perideridia parishii), ranger’s buttons (Sphenosciadium capitellatum), and bracken fern (Pteridium aquilinum). Chino Hills State Park is unique in that it provides refuge for both biodiversity and solitude to the visitors who enjoy their outdoor experiences. There is no other location in the LA Basin were people can drive a short distance and be swept away with scenic vistas, hike, bike or ride a horse on over 90 miles of trails. At 14,102 acres the park is managed as an open space habitat where all plant and animal life are protected. You can see rows and rows of California Poppies here, along with many other types of wildflowers. Garner Valley is the land between the San Jacinto Mountains to the north and Rouse Ridge-Thomas Mountain to the south. Garner Ranch cattle still graze the valley today. Valley floor wildflowers include spectacular patches of yellow goldfields (Lasthenia californica) and tidytips (Layia ziegleri) in early spring and magenta fields of the endemic four o’clock (Abronia villosa var. aurita) during the summer. Along the edges, a wide range of interesting species grow in a narrow abound just above the valley: the endemic Johnston’s rockcress (Arabis johnstonii), California penstemon (Penstemon californicus), long-spined spineflower (Chorizanthe polygonoides var. longispina), and rock jasmine (Androsace elongata ssp. acuta). The view to the south, along drainages of Thomas Mountain, includes stands of big cone douglas fir (Pseudotsuga macrocarpa), an uncommon conifer of southern California. Two species of pinyon pine intermix in the southern edge of Garner Valley: single leaf (Pinus monophylla) and four-leaf (P. quadrifolia). The Arboretum is in the San Bernardino National Forest at an elevation of approximately 6000 feet. The Arboretum provides an ideal setting for young children to enjoy the forest and experience nature with their parents. Heaps Peak’s unique arboretum and botanical gardens greet visitors with a diversity of native plants, and trees. Here you will find a large variety of flora and naturally occurring wildflowers in the spring and summer such as Penstamon, Buckwheat, Poppies, Sierra Currant, Gooseberry, and Coffee Berry. Native herbaceous perennials and introduced native plants can be found in the gardens. The Arboreum is free to the public to visit, although the Forest Service requires that an Adventure Pass be displayed on each car parking at the Arboretum. A $5.00 daily pass can be purchased at a number of places locally and at the Arboretum when the Information Booth is open on weekends. The San Bernardino National Forest contains many beautiful, interesting and unique wildflower viewing experiences. The San Bernardino and San Jacinto Mountains of southern California support a disproportionately high botanical diversity, many rare and endemic plant species, and landscapes that explode with color during the late spring and early summer months. An interpretive trail managed jointly between the San Bernardino National Forest and California Department of Fish and Game provides a focus on rare plants and wildflower displays. Wet meadows with waves of iris and rare checkerblooms and margins of rare purple and yellow monkeyflowers separate rounded knolls of clay soils and quartzite cobbles known as pebble plains. In the spring the pebble plains are awash with rock cress and violets, with flashes of shooting stars and milk-vetch here and there. Most pebble plain species are tiny, and some are best appreciated close-up while lying flat on your belly. The diversity of pebble plains is comparable to coral reefs, with as many as 20 species in a square meter. The best time to visit and enjoy is during April and early May. Nestled mile-high in the foothills of the San Bernardino Mountains, within the historic farming community of Oak Glen, lies The Wildlands Conservancy’s Oak Glen Preserve. The 2,189-acre preserve is home to the Conservancy’s Southern California Montane Botanic Garden and Children’s Outdoor Discovery Center. It is open to the public completely free of charge. The Artist’s Palette, the newest venue at the Wildlands Conservancy’s Southern California Montane Botanic Garden, bloom with native wildflowers. Inspired by the painter’s palette used by French Impressionist painter Claude Monet (1840-1926), botanic garden director Tim Krantz selected 20 native annual wildflower species that, when in full bloom, mirror the pattern of colors on Monet’s palette. The flowers bloom from mid-March through June. The Santa Rosa and San Jacinto Mountains National Monument is located in the northernmost end of the 900-mile Peninsular Range of Southern and Baja California. This land is both the ancestral and contemporary home of the native Cahuilla people. Although this is a very interesting area to view from the car, the best way to see it is to hike the trails or visit the high country by way of the Palm Springs Aerial Tramway. Unique plant communities include the palm oases. California fan palm (Washingtonia filifera) grows in the lower elevations of several desert canyons. Indian Canyons, managed by the Agua Caliente Band of Cahuilla Indians, is accessible by car and short hikes. Other smaller oases are in Palm Canyon. Many of the plants used in basketry also grow in these desert canyons: deergrass (Muhlenbergia rigens) and basket rush (Juncus textilis). Singleleaf pinyon (Pinus monophylla), desert agave (Agave deserti), California juniper (Juniperus californica), Western bernardia (Bernardia myricifolia), desert ceanthous (Ceanothus greggii), hollyleaf cherry (Prunus ilicifolia) Mohave yucca (Yucca schidigeri), along with other species flourish in the Pinyon Flats area along Highway 74. The high country of the San Jacinto Wilderness, both State and Federal, includes seasonally moist mountain meadows with both corn lily (Veratrum californium) and lemon lily (Lilium parryi). Limber pine (Pinus flexilis) and lodgepole pine (P. contorta ssp. murrayana) also grow here. The dry desert peaks of the Santa Rosa Range support several near-endemic species: rock draba (Draba corrugata), Ziegler’s aster (Dieteria canescens var. ziegleri), shaggy-haired alumroot (Heuchera hirsutissima), and Davidson’s stonecrop (Sedum niveum). If you’re plannning a visit to San Bernardino to see the wildflowers, you may be interested in extending your stay and booking a night or two at a local hotel. Here are a few recommends for the area. All studios and cottages feature a fireplace and free Wi-Fi at this lodge. A common area with a playground is available at this family-friendly property. Big Bear Lake is less than a mile away. Budge friendly hotel with free WiFi and a seasonal outdoor pool. Certain rooms have a seating area to relax in after a busy day. Featuring a landscaped courtyard with a heated outdoor pool, this European-style hotel is located just off the Chino Valley Freeway and less than 5 minutes’ drive from the city centre of Chino Hills. Just off Interstate 10, this hotel is adjacent to Oak Valley Golf Club. It features an outdoor swimming pool and daily breakfast. Guest rooms offer free Wi-Fi and cable TV. The beautiful display of wildflowers will be easily accessible to visitors of the lake’s seasonal wildflower trail, which opens to the public today on February 24, and will remain open daily until the blooms fade in late spring. In addition to fields of orange California poppies—the state flower—visitors can expect to see blue royal lupines, purple canterbury bells, yellow ranchers fiddleneck, white popcorn flowers, and pink red maids, among other wildflowers. The best time to see poppies in blooms is from 9 a.m. to 3 p.m., as they need full sun. The wildflower trail—part of the Southwestern Riverside County Multi-Species Reserve—is a 1.3-mile loop extending from the Lakeview Trail. The trail is rated as an easy-to-moderate hike with some rugged terrain and will be open from sunrise to sunset. Two other trails are open to the public year-round and also afford good views of the blooming flowers—the 26.1-mile Lakeview hiking and bicycling trail that circles the 4.5-mile-long lake and the 5.9-mile North Hills trail for equestrians and hikers. Another viewing option is to rent one of the lake’s bass or pontoon boats, bring fishing poles and lunch, and enjoy the 360-degree views from the lake itself. Since the Idyllwid Nature Center is located at a higher elevation in the San Jacintos Mountains, wildflowers bloom later in the season. In late May, you’ll find a variety of species, including western azaleas, snow plant, rosy “pussytoes,” a variety of lupine, both leafy & Alpine asters, evening primrose, meadow monkeyflower and a variety of penstemon. A nice hike consists of taking the Summit Trail from the nature center down to the meadow in the County Park, then returning via the Perimeter trail. This route will take you through different micro-climates, which result in different wildflower varieties. The Santa Rosa Plateau Ecological Reserve, located at the southern end of the Santa Ana Mountains in southwest Riverside County near the city of Murrieta, is a hidden gem that offers a fascinating glimpse into the history and ecosystems of the area. Wildflowers usually peak in the first week of April. There are white, pink and lavender shooting stars to see, purple and white lupine blooms and bright orange California poppies. Chocolate lillies also bust out along the Vernal Pool and Trans Preserve trails. Some of the most beautiful poppy meadows in Southern California are located north from Lake Elsinore – Walker Canyon poppy fields. Countless flowers color the steep hillsides in both sides of Corona Freeway nearly every year in late February – April. Walker Canyon and its vicinities is one of the few places where one can find Coulter’s Matilija Poppy, San Bernardino spineflower and many other very rare plants. If you’re heading to Riverside to see the wildflowers, here are a few places to stay and get a good night’s sleep. This is a very clean and attractive hotel. Staff goes out of their way to make guests feel welcome and comfortable. Complimentary breakfast is included. Stay the night at this magnificent lodge! Simply stunning. Located on a perfect piece of property that affords not only one of the best views possible of Idyllwild, but also privacy. If you’re looking for a clean, comfortable hotel with a decent price, this is it. Continental breakfast is provided. A clean, convenient hotel that offers free breakfast with a make-your-own waffle bar and continental breakfast items. All these sound so beautiful! I’d love to see them for myself. I particularly like the idea of the yellow goldfields – sounds like something from a fairy tale! Our deserts are in a super bloom right now too. It is gorgeous. Thanks for stopping by. I never think of California as a wildflower destination, but your post has taught me otherwise. It would be such a fun family quest to see how many different kinds you can spot. First off, I love the name of your blog! Secondly, we have flowers in bloom almost year round in SoCal, but the fields are explosive in the spring after the rain. Right now we are in the middle of a super loom. Where are you from? What part of Europe are you from? I have only been to Germany. I hear the flowers are going to be insane this year. Wish I still lived in San Diego! Enjoy! We are going to have a super blom. Only happens once in 20 yrs. Cool! Thanks for visiting! I am actually going a hike tomorrow morning to see the wildflowers in Orange County, CA. I just went yesterday on a hike and it was amazing. I’d love to see the explosion of color made by these wildflowers! I haven’t seen something like that since I lived out west a couple of decades ago. It is definitely beautiful. Where in the west did you live? Oh wow! So many wild flowers!